It’s 2015. It’s time to do that thing we all love to do, change our passwords. With the recent news of hacking attempts and exposures like the Target breach, Heartbleed, or the most recent news about Chick-Fil-A being hacked, it is a good idea for everyone to pay attention. I wonder if they use any Enterprise Password Management Software. Security experts recommend we change all of our passwords at least every 90 days. But how do you manage all of those passwords? From passwords on computers to email accounts and banking web sites, it’s almost impossible to remember every one, especially if you make each one different and the recommended 8 characters long with numbers and letters with a few special characters thrown in there for good measure. And no, “Password” is not secure enough. For the average person, trying to remember all the different password they use on a daily basis is almost like trying to paint a house with your eyes closed… Not really recommended. To compensate for remembering, we usually pick one password we can remember and use it everywhere. Even worse, we may write them down on a sheet of paper. Do you remember taping your password to the bottom of your keyboard. Can we say, identity theft? In today’s post, I will show you how you can overcome all of this by using a free password manager software tool built just for remembering and keeping up with all of your passwords. Enterprise password software is becoming quite common these days and can be a big help with the headaches I just talked about above. Enterprise password management software can store your passwords for you to all the different web sites electronically and even help you keep things like your credit card numbers, drivers license info, or any info you deem “secret squirrel” centralized and safely tucked away in an electronic vault. The following applications are ones that SurePoint IT Solutions recommends to help you store your password. Summary – Dashlane is one of the most recommended applications on the web for managing your passwords. In fact, it was originally recommended to me by Clark Howard. With features like the password manager, integration with your web browsers, a digital wallet, and the ability to share passwords with a team of people, it’s a pretty awesome tool. In fact, I use this personally and have implemented it throughout SurePoint IT Solutions for all of our employees to use. The free version can be used on 1 device, but the premium version which costs only $39.99 a year can be installed on all of your computers and mobile devices and has the ability to sync from one device to another. Change a password on one computer, Dashlane syncs that password with its servers and all of the other computers automatically. Worried about security? Don’t be. Dashlane uses AES-256 bit security to keep your information safe. Try it for free and if you like it, I recommend paying for the premium version. 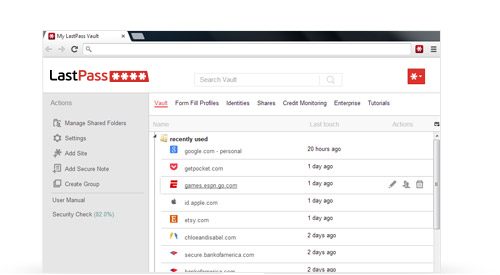 Summary – Much like Dashlane, Lastpass features include a lot of the same feature set. Lastpass has a central management application that you install on your computer but also backs up to the cloud. 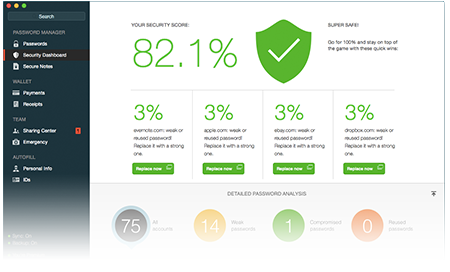 The free version scores you unlimited browser syncs, automated fillings of logins in things like web forms and secure notes for digital recordkeeping, but it goes a step further and allows you to share password credentials with friends or colleagues. The premium version gets you tech support as well as the ability to enforce multi-factor authentication. Summary – Keeper cites themselves as a “zero-knowledge provider” which means that only you can decrypt and view your data. Using AES with 256-bit encryption, the “keeper” as the client is called is the only one that holds the key to the data. With their solution, your password unlocks all of the data. By the way, 256 bit is secure enough to encrypt classified data deemed “TOP SECRET” for the US Government. If they trust it, so should you. Using an enterprise password manager can be an eye opening experience. Last time I looked I personally had over 100 unique passwords to log into every different web site I use and it grows every day. I recommend at least giving one of the tools I mentioned a try. You will instantly see that it gives you peace of mind. If you are a business owner in Cleveland, GA and are concerned with security, contact us for a FREE Network Audit. At no charge to you, we will inspect your network to pinpoint any vulnerabilities to viruses, hackers, data loss or spyware and to show you how you can get better performance, speed, reliability and LIFE out of your existing computer network. How about you? Have you tried any enterprise password storage software? How do you manage your passwords? Do you use some other enterprise password management software I mentioned here? Did I leave out your favorite password manager software? I’d like to hear your thoughts below!